Museums are going mobile these days and the benefits are numerous. 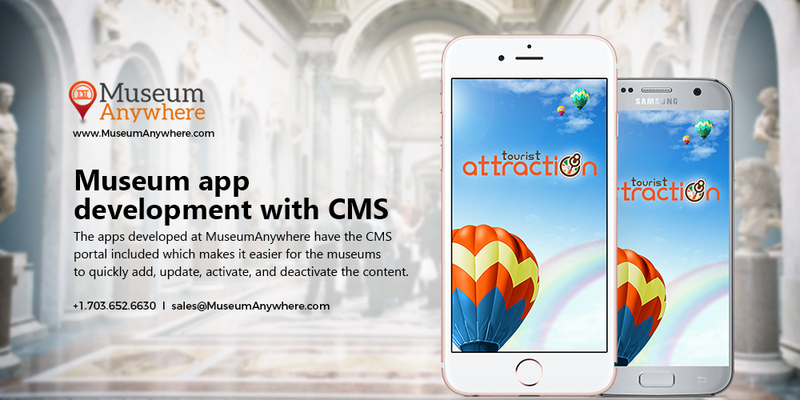 As we are in the beginning stretch of 2018, we are here to announce museum app development with CMS (Content Management System) to help museum grow and stay connected with the audience. Not just this but it also enhances the visitor’s as well as the museum’s experience with a dynamic application that works on all the platforms (smartphones, iPad and tablet). So what basically CMS do? CMS is divided into two parts CMA (Content Management Application) helps the content manager to handle the modification, removal or creation of content without the help of a developer even if he does not know the HTML programming knowledge. CDA (Content Delivery Application) on the other hand helps to modernize the application. The apps developed at MuseumAnywhere have the CMS portal included which makes it easier for the museums to quickly add, update, activate, and deactivate the content. iBeacon Technology integration within the app! Out of the Box Social Media Integration! Outreach the visitors for long lasting relationships! An app can offer tremendous value to your museum and finding a solution that helps your business achieve its goals is important.